The unstable TRANSITIONAL MODE. It's importance. - Sitting Safely? The unstable TRANSITIONAL MODE. It’s importance. This is not just a quick transition from the reclined to the upright modes (2T) but provides physiological benefits and is itself a mode. The concept is renamed the Tr-Modal (3M). 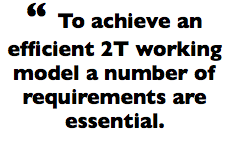 2T = 3M. This may seem counter-intuitive. 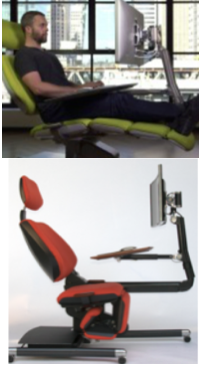 Why shouldn’t the user be able to sit easily in any position that seems comfortable? It worries chair designers dreadfully although they may not be bothered by the ‘dynamic seating’ concept.. 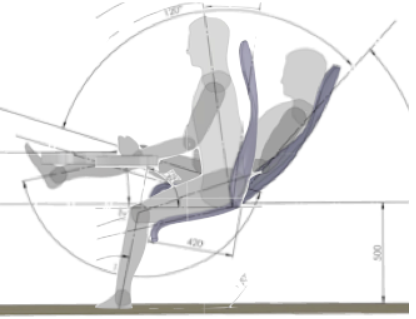 It is, equivalent to the mid upright position of most office chairs, carrying an ergonomic penalty. A user, used to a mid-upright chair, could use an adjustment to maintain this position for long periods which would add an unnecessary adverse effect to an otherwise optimal system. 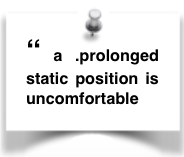 The intermediate positions being unstable require muscular effort to be sustained. 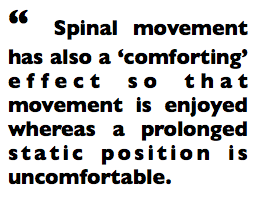 On moving back a few degrees from the stable forward upright mode the occupant enters this upright unstable position which provides proprioceptive feedback and frequent small amplitude pressure changes. A user has a choice and may find a short episode of this low amplitude exercise pleasant. Longer periods are liable to be tiring. There is also an added advantage in providing therapeutic exercise following an acute LBP episode with it’s resultant muscle and reflex atrophy. (See ☛Anatomy/muscles). Why add to extra cost? The ALTMARK Chair has both a reclined and upright mode which makes it interesting and ahead of the market. The webpage shows a fixed intermediate position in both the reclined and semi upright modes. At best it gives no biomechanic advantage and was probably intended to add comfort → . Misled by ” that treacherous guide which only turns up truthfully when the ergonomics are fully correct”. If this mode becomes a part of the unstable intermediate mode it allows a faster transition and also gives the user the choice for dynamic motion and rehabilitation. A win-win. Scrapping a fixed intermediate mode reduces manufacturing costs. A win-win-win! This entry was posted in Uncategorized on July 1, 2015 by Dr. Henry Sanford.